Brian Westbrook is the running back fro the Philadelphia Eagles and was picked by them in the 2002 NFL Draft. Westbrook is short for an NFL runner, though broad, and is one of the unique players in fantasy football. Brian Westbrook is chronically "dinged", though he hasn’t missed a game in two years. And when he’s on the field, few players get as many touches on the ball as Brian Westbrook. In receptions leagues, Westbrook is especially dangerous, because he’s likely to get 10 receptions on swing passes out of the backfield. In the Eagles West Coast Offense, they treat the pass to the RB as just another type of handoff. Lorenzo Booker was brought over in a trade from the Miami Dolphins in the offseason. Booker offers some of the same things Westbrook does, being a smaller, quicker runner known for his pass-catching skills. Also, the team took Tony Hunt in the third round last year, once again in the hopes of taking some of the load off Brian Westbrook. That never seems to matter. Once again, I expect to see Andy Reid and Donovan McNabb relying heavily on this offensive machine, at least as long as he holds up. In the tough NFC East, the Philadelphia Eagles probably aren’t going to spend a lot of time breaking in young runners against the Cowboys, Giants and Redskins. Brian Westbrook played college football at Villanova University (in Philadelphia, for those non-Philly residents) from the 1997 season until the 2001 and during that time set the record for the NCAA for most al purpose yards ever. He rushed for over 1,000 yards 3 different years and had over a 1,000 yards receiving in the 1998 season becoming the first college player at any level to do so. This was all done while he struggled through several injuries. He entered into the 2002 NFL Draft where he fell through to the 3rd round. There were several reasons why he did not get picked up earlier; one being that he is small for NFL running backs being listed as 5�8�� and weighing just 200 pounds, the second being that he had a lackluster injury history (he missed a whole season due to a knee injury), and third that he hadn�t played for a top tier division one school. Coach Andy Reid decided he liked what he saw and took a chance on him, a chance that has paid off huge for a coach looking for the perfect West Coast runner. He saw limited playing time his rookie season. But in 2003, Bryan Westbrook showed some of the things to come but missed out on the playoffs that year due to a torn tricep muscle. 2004 became his breakout season as Staley left the team and Buckhalter was injured in pre season. That season he helped the Eagles to the Super Bowl and despite the loss had a stellar game that prompted a ticket to the Pro Bowl. The 2005 season started strong but saw Westbrook miss part of the season due to a mid foot injury. 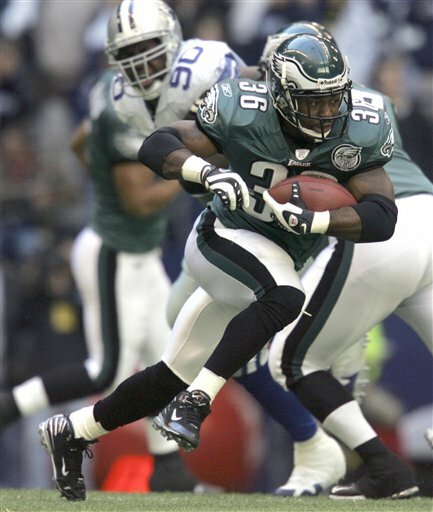 Despite early concerns for from a swollen knee the 2006 season showed the productivity Westbrook is capable of when he rushed for over a 1,000 yards and helped put the Eagles in the playoffs. Last year Westbrook continued his fine form and he pushed past barriers form the previous season. He rushed for 1,333 yards and a total of 2,104 from the line of scrimmage had him leading the NFL. What can you say about Westbrook? He excels in so many ways that defenses don�t know how the little guy will pop up and torment them next. He is not just a great runner but he has some of the best hands, if not the best hands, of any running back in the league. Rushing for well over a thousand yards, catching 90 passes from the backfield, and scoring twelve times, he got it all. There is not a more complete player out there. Even his �lowly� numbers were not too bad at all. One two occasions he �only� came up with 92 total yards, and he still scored once in both of those. Though the Eagles do have a tougher running schedule this year he is such a multi threat that it really doesn�t matter anyway. The only down side to Westbrook is the injury factor. They have said that they relied on Westbrook too heavily last season and they would reduce his touches for the upcoming season to keep him from picking up any injuries. Hmm, is that just an echo? Because they said the same exact thing last year, and it looked like he touched the ball as often as ever. Westbrook is a regular on the team medical sheet, but even though he might have nagging injuries here or there not since 2005 has he missed any significant amount of games. He seems to be one of these players that unless he is really injured to the degree of not being able to play he can push through the minor ones. Westbrook is 28 so he still has a couple of peak seasons left in him and there is no reason that he shouldn�t be one of the very top players in your draft. Brian Westbrook is coming off two offseason surgeries and the team is claim that 3rd round talented RB draft pick LeSean McCoy will get significant carries in 2009. Now, the Philadelphia Eagles have said the same things before about Correll Buckhalter and even Lorenzo Booker before, but for some reason, I actually believe them this year. Westbrook is 30 years old now and he’s always been dinged up with some nagging injury or another. Brian Westbrook has been a warrior over the years and he’s always played hurt, but Westbrook is also the kind of running back who’s burns out sooner rather than later. I think one year Andy Reed is going to go to the Westbrook well and the well will be dry. I’m not saying 2009 is the year, but it could be. If you’re in a keeper league that lets you keep a decent number of players, draft LeSean McCoy. If he’s not going to replace Brian Westbrook this year, he very well could in 2010. It’s going to happen and probably in the next couple of years. Buckhalter is gone now, by the way. As for Brian Westbrook, I wouldn’t spend a first rounder on him and I might talk myself into another player in the 2nd round. That being said, Brian Westbrook has so much upside, I would probably draft him at a point in the 2nd round (when players I’m really excited about having as my 2nd best player are gone) and hope for one more great season. I mean, it’s not like Brian Westbrook turns into a pumpkin on his 30th birthday, but history has shown that most running backs don’t sustain their careers too long after that. Think Ricky Watters. Think Shaun Alexander. Think Eddie George. Think Priest Holmes. In the NFL, it’s here one day, gone the next. I’ve seen Westbrook go as high as #2 in mock drafts, and his consistent production warrants those picks. The problem is, Westbrook is chronically on the injury report. Though he’s tough enough to keep playing, it drives fantasy owners crazy. His small stature and the huge number of touches he’s gotten in recent years seem to suggest he’s a major injury risk. If you assume that injury risks are all about the same with the runners, then Westbrook should be a Top 3 runner. That’s especially the case in fantasy leagues which give extra points for receptions, because the Eagles throw the ball to him out of the backfield like it’s another handoff. Westbrook is in his prime years, so if you assume that his small stature won’t hurt him, he shouldn’t slow down for another couple of years. Brian Westbrook is a heartbreaker as a fantasy football player. Every year, I look at his numbers, but then I think, "He’s an injury risk," and I pass on him. Then he puts up twice the numbers of the guy I drafted. But I’m convinced the year that I spend a 1st rounder on Westbrook is the year his body finally falls apart. And every year gets him one step closer to that eventual fate. 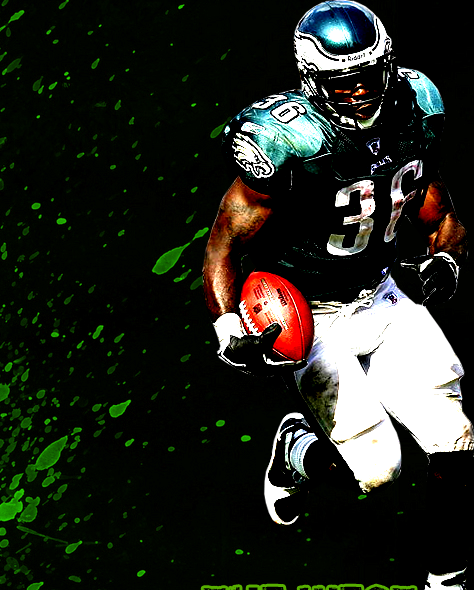 In the end, Brian Westbrook is a player with huge upside and huge downside. Most running backs are that way, anyway, because runners take the pounding of 20-30 touches a game and therefore are more prone to injury than most positions. So every runner has those same upside/downside issues; it’s just that Brian Westbrook is an enhanced version. If you want to take a gamble, then draft Brian Westbrook in the Top 3. Considering that there’s good reason (after several years of production) to assume he will produce close to what he did last year, you can build a championship team around those numbers. But don’t say I didn’t warn you if the wheels come off.